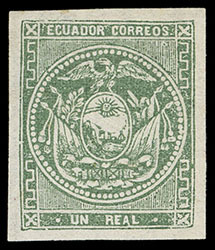 Ecuador, 1865, 1r Green, group of nine singles in a range of shades, including two yellowish green shades of the first printing, three without gum, others full o.g. with gum color white to yellowish brown, margins mostly clear to ample, couple with small flaws, otherwise F.-V.F. overall. Scott No. 5 Estimate $1,000 - 1,500. 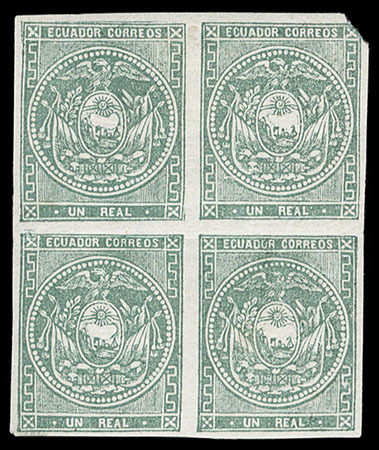 Ecuador, 1865, 1r Green, three mint marginal singles showing full to complete margin rules, two top right corner margin no gum singles from position 9 and a left margin o.g. single from position 19, one with full margins, other ample to touching, one corner margin single with light crease in margin selvage, F.-V.F. Scott No. 5 Estimate $200 - 300. 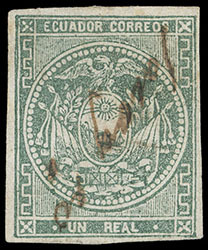 Ecuador, 1865, 1r Green, block of 4 (positions 43-44 & 52-53) showing plate flaws in position 43 with part of double frameline at top, o.g., hinge remnant, ample margins with small clipped corner at upper right, strong bright color, F.-V.F., this being the second largest recorded block, with four blocks of four known, ex-Hubbard and Lund; with 2013 Moorhouse certificate. Scott No. 5 Estimate $2,500 - 3,500. ONE OF FIVE UNUSED BLOCKS RECORDED OF THE 1 REAL GREEN ISSUE. 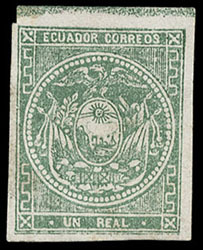 Ecuador, 1865, 1r Green, Embossed Arms, group of five singles; includes mint o.g. and used from position 1 and three examples from position 81 used including one on piece tied by manuscript "Riobba" of Riobamba, mint with full margins and used with clear to ample margins, two into design with one just slightly, F.-V.F. overall, scarce especially in mint condition. Scott No. 5b Estimate $500 - 750. Some sheets were printed on official paper which had a dry embossed seal, placed vertically in one of two positions of the sheet in one of the four corners, so that only one or two stamps per sheet featured this variety (positions 1-10, 9-18, 73-82, 81-90). 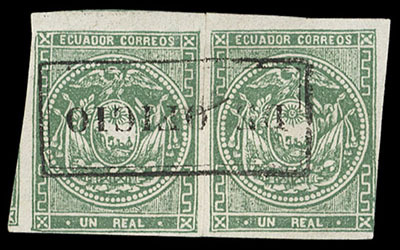 Ecuador, 1865, 1r Green, 6 singles showing major plate varieties; mint o.g position 43 double frameline at top, mint no gum position 4 double frameline at base and position 71 colorless line though "REAL", and three used position 66 diagonal colorless line through design at bottom right, position 71 with hinge thin and two used with small flaws, F.-V.F. Scott No. 5 Estimate $150 - 200. 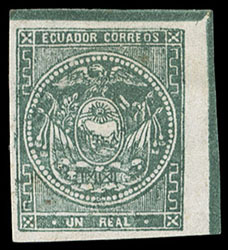 Ecuador, 1865, 1r Green, Diagonal Bisect, group of nine bisects on piece, includes six usages at Cuerna from September 1866 to September 1868, and three others bearing townmarks from Guayaquil, Ibarra and Guano, Very Fine. Scott No. 5a Estimate $500 - 750. 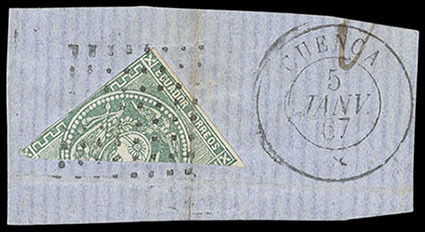 Ecuador, 1865, 1r Green, manuscript "Zaraguro" of Loja Province, clear to ample margins, small tear at right, Very Fine appearance, this being the only example known of this manuscript cancel. Scott No. 5 Estimate $400 - 600. 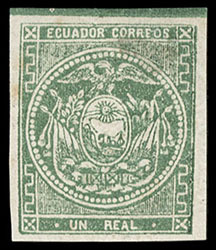 Ecuador, 1865, 1r Green, the items bearing manuscript "Riobba" cancels of Riobamba; includes yellowish green shade single on piece, pair and single on piece additionally tied by dotted lozenge and a August 1865 Riobamba circular date stamp alongside, also a vertical strip of four with additional lozenge cancels and manuscript "Riobaba" spelling; some small flaws, Very Fine appearance. In the summer of 1865, new handstamps including circular date stamp and dotted lozenge arrived at Riobamba. In spite of this, manuscript cancellations were still used to cancel stamps, but in combination with the new handstamp postmarks. 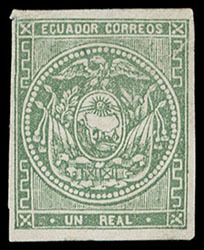 Ecuador, 1865, 1r Green, rejoined horizontal pair, with complete central strike of boxed "De Oficio" cancel, small thin in right stamp, a Very Fine and choice strike, this handstamp was applied to official correspondence and rarely used as a cancelling device.